I have just tried to erase the Wunderground API key from my Opensprinkler configuration due to the changes on the API service (I already had an API key when there was the announcement of the changes, so Wunderground is someway and sometimes still working for my system, but I would like to change to follow the next default OS weather adjustment configuration), but since when I did it I’ve experienced the behavior described by Ottorino and Jamba in replies #50739 and #50895. 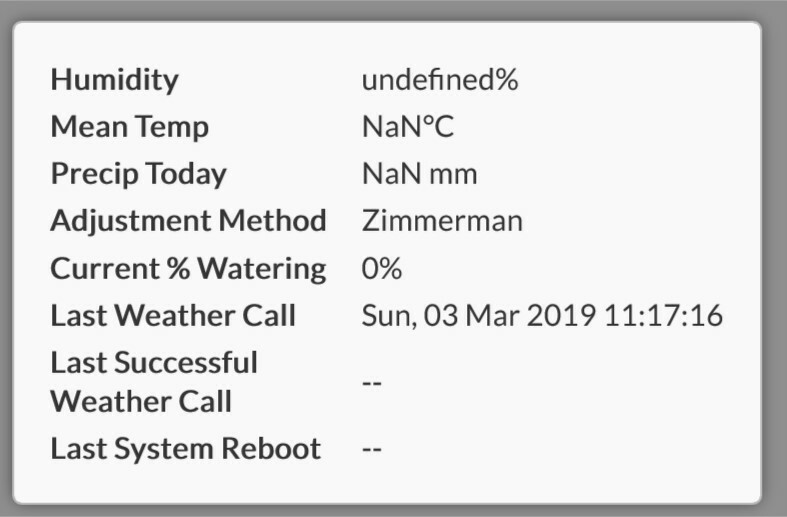 So, I intend that now the default behavior of the Zimmerman weather adjustment method is to stop all the programs running in the nighttime, when the water level is always 0%. – keeping on irrigating during the nighttime (but without the useful adjustments of the Zimmerman method). Is it planned any action to avoid this situation and this choice? Just so that you know: API keys for PWS non-commercial users are going to continue to allow the PWS owner access to all their data. There may be another gating mechanism (rather than keys) in the future, but there is no plan to discontinue PWS access. Can someone please post an instruction what to do? Is removing the API key enough to get weatherdata from OWM? How can my unit see where it is located if I remove this API key? Because the API key now contains the location via Wunderground. This reply was modified 5 months, 2 weeks ago by GregoryNeefs. @gregoryneefs In my experience, removing the Wunderground API key is enough to get weather data from OWM, anyway I keep on having the same problems described by Ottorino and Jamba in replies #50739 and #50895. The settings about the location of the Opensprinkler unit are in the “Edit Option” page, in the “System” section. I erased the Wunderground API key some time ago and I get weather data and forecast information related to the location I configured in this section. “removing the Wunderground API key is enough to get weather data from OWM” — correct. Just remove the WU API key and the weather service will automatically switch to us OWM data. Hi I have looked through the forum regarding the stop of the Wunderground API keys and found that by simply deleting the API key from settings Opensprinkler should then default to OWM API. As of yesterday I noticed my weather info in opensprinkler has stopped working (im picking this is due to the WU API) adn not showing weather info (Temperature and image). So I have gone into my settings and deleted the API key in hopes of it defaulting to OWM but I still do not get any weather info, therfore my sprinklers are on while its raining hard…. We’ve made several changes over this weekend to enable the display of weather information through System Diagnostics again (it was disabled because after switching to OWM we haven’t hooked up the OWM information to the System Diagnostics dialog). The changes are now pushed in. They should be available soon depending on how you access the controller — if you access the controller through IP directly (using a browser), it should be available now; if you use Android app, it should be available once the android app is updated; if you use iOS app, it’s under review now and should be available in a few days once it passes review. since this change, I don’t receive any weather info (see NoWeatherInfo.jpg). I have my personal PWS that is linked to Wunderground and I still have an API key. So everything was working until the change this weekend. I also can’t choose a new location anymore, the cirkel keeps spinning (see ClickLocationNoReaction.jpg). This. Since updating Android app my system no longer adjusts according to weather. WUnderground used to work until today. I have deleted location, but am unable to re-specify a location – just a spinning wheel as above. I’m trying to delete my weather underground api key but I can’t find it. I know it’s still set because I can see it in the json file after backing up my system (wtkey). It no longer appears in the options or advanced options. The weather service has been updated to no longer read this key so the option in the app has been hidden as the option is useless now. The import portion of the app will also ignore the wtkey so it won’t be imported on restore. Moving forward we want to focus on improving our implementation using OpenWeather Maps and avoid the Weather Underground API shutdown/changes and also avoid the Yahoo weather API which was used in the app for the weather data. Is there any way to unhide the option temporarily so I can delete the key? I don’t like having deprecated settings left behind. From the web browser I did an export, import and export and the wtkey was still in the second export file. Next I tried removing the wtkey from the original export file, importing it and then exporting again and the wtkey was in the last export file. Not only does it not appear to be ignoring the key it also appears to keep it from the currently running system. Do I need to start with a clean system for the import to ignore the wtkey setting? 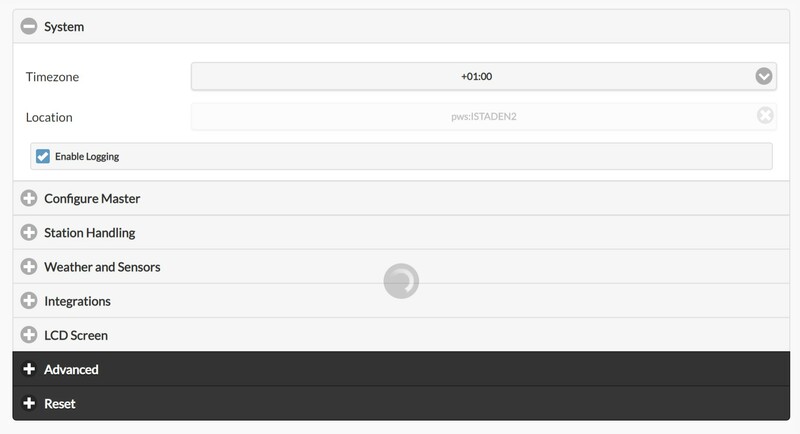 If you inspect the network tab when submitting your settings you will see something like the attached image. 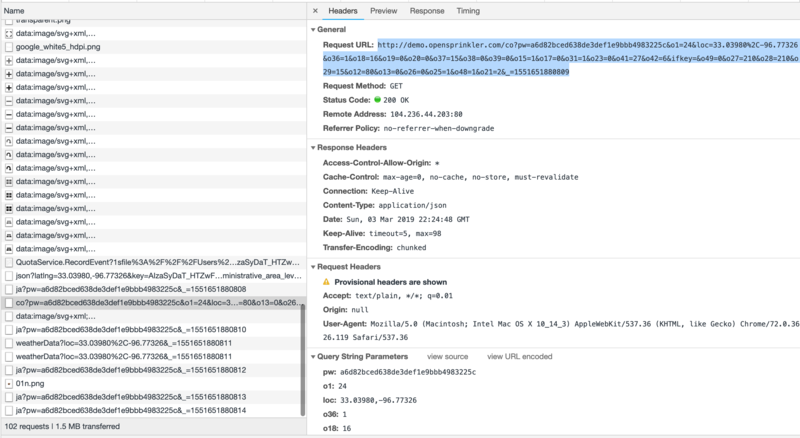 Simply copy the highlighted URL and add the following: &wtkey= to the end of the URL and submit the request in a separate browser tab. If it comes back with result: 1, then its a success and the key should be removed. This reply was modified 1 month, 3 weeks ago by Samer. I just did a reset (reset all station data) and then an exprt and the wtkey is still there. That key does not want to go away. Resetting station data has nothing to do with the Weather Underground key which is a system setting. Please refer to my previous post.